When I first saw Michell Lonas’ artwork in a magazine, I knew this came from someone with a deep connection to nature. His bird nests called “The Wrench Series,” are truly extraordinary. 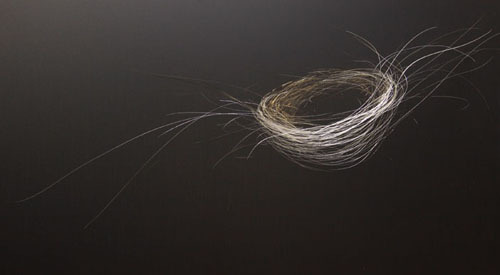 Mitchell’s nests seem to be suspended in air and have a lightness and a 3d quality to them. But truth be told, they are 2d images created on steel and aluminum panels that he first paints, then carves into with any manner of sharp objects; nails, wood carving tools, chisels, dental tools- essentially anything with a sharp edge to create a sense of light and movement. Mitchell believes there is a definite texture to his work but also the illusion of texture which he works hard to achieve. In Mitchell's own words, "By viewing these pieces, perhaps I can 'tell' you something about myself. The series is my attempt to reflect a spiritual connection with creation." He adds, "To me, they are perfect examples of how nature creates the most admired pieces of art." In early spring of this year, Bryce and I drove up to Asheville, North Carolina and met Mitchell in his studio. It’s a true artist’s studio with lots of space and scattered supplies and inspirational objects. My favorite part was Mitchell showing me all the nests he has stored in various sized boxes. The above is a barn swallow nest that is shallow and surprisingly heavy. 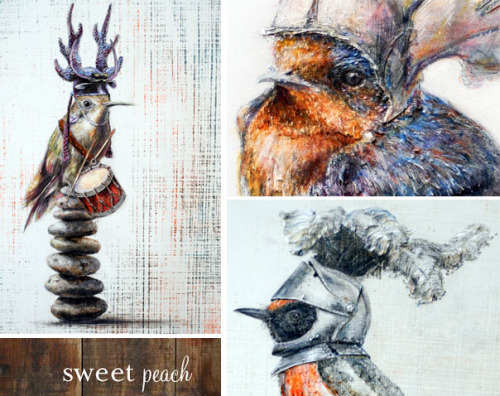 Another wonderful series by Mitchell is called Bird Armor which features small song birds in protective armor. He was inspired one Christmas to create these paintings for his family, with each one depicting a different personality. His current series of work, which features feathers, is called "Alight." These newest pieces can be viewed at the Blue Spiral 1 Gallery in Asheville from October 6-December 31. So stunning. As Mitchell explains, "When a mother bird is ready for her young to take flight, she starts making the nests uncomfortable and begins to throw out all the down feathers." He sees this series as a natural progression from his nests or the instinctual next step. Looks like Mitchell works much like Mother Nature does. Learn more about the wonderfully talented Mitchell Lonas here.